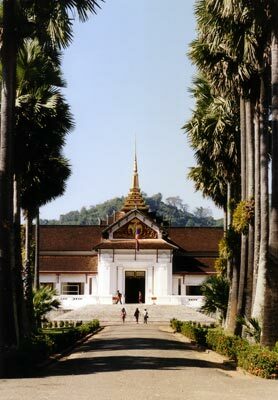 When I was awakened by the gentle sounds of the morning rites on my first day in Luang Prabang, I understood why staying across the street from a wat was actually not a tourist magnet. Personally I found the surprise amusing, and didn't regret my choice of guesthouse. Luck had led me there. Upon arriving at the airport the previous evening, I had pulled out a name at (almost) random from my guidebook for the tuk-tuk to drive me there. 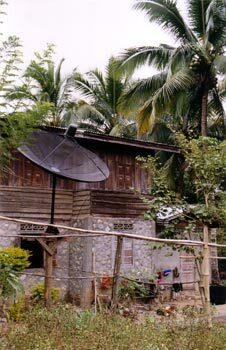 The place was full so I went next door: there (Xieng Mouane Guesthouse) they had just one room left. They also had a lovely garden and hot water for tea available at all times, not to mention being smack downtown. As I found out later, the town was packed, so I'd been lucky to find a room at all. By then I was growing fond of seeing flashes of saffron crossing my field of vision every now and then, and every morning I gladly woke up to the chanting next door. 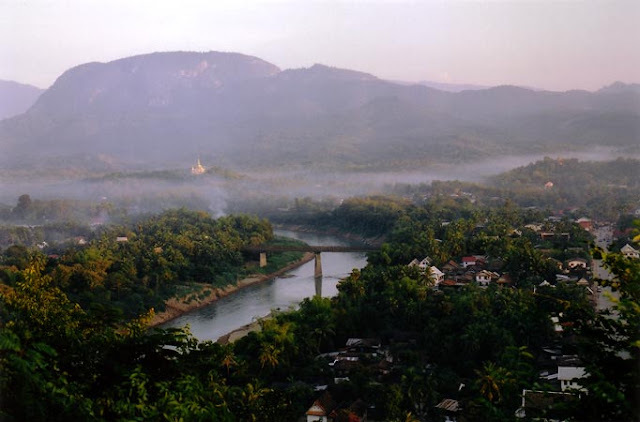 The weather is funny in Luang Prabang, at least this time of year: it is foggy and cool in the morning, but by noon it has all cleared up and there isn't a cloud left to protect us from the baking sun. By "cool" I mean I had to wear a long-sleeved t-shirt to be comfortable, but the Laotians, the poor monks in particular, were really cold, and you could see monks scampering about in woollen scarves and caps – in colours matching their robes, of course. The morning mist slowly dissipates as the sun heads for the zenith. 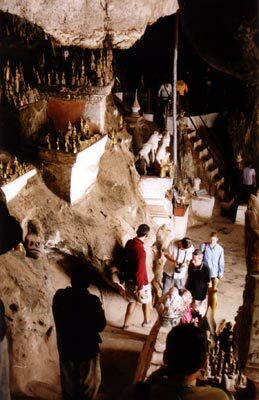 I stepped outside on my first morning and walked down towards the Mekong, only to be asked if I wanted to go on a tour "to the caves" with a group that was ready to go. I said okay and I'm glad I did. We sat in a mercifully larger version of those really thin, really flat Laotian boats that threaten to tilt and fill up with water if you so much as sneeze in a direction that's not parallel to them, and were off upstream. There was a wat in that village, where an old monk was sitting at a terrace, smoking. 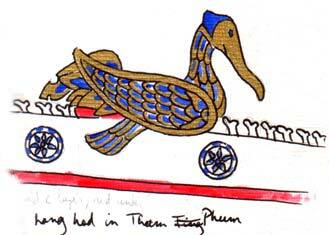 Meanwhile one of our group, an Australian, couldn't resist beating the wat's drum energetically as we passed. That made the old monk chuckle then laugh, laugh till he was coughing over his cigarette. And I'd thought he'd be outraged! I spent the afternoon walking around the town's more shaded streets. 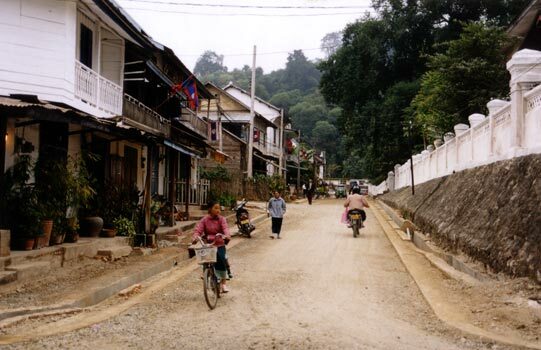 Luang Prabang is tiny, so tiny there was no point at all in renting a bicycle. 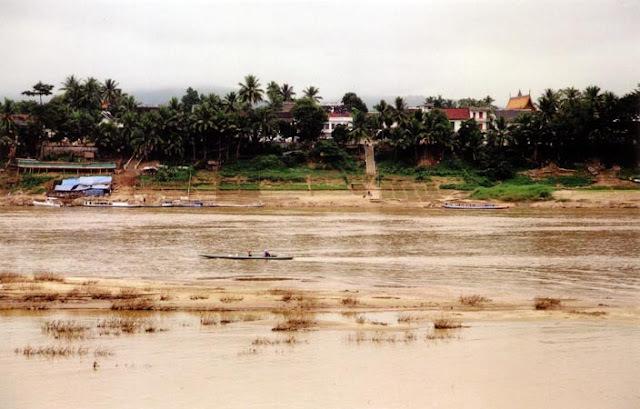 It is one of the most charming little towns I have seen, an architectural jewel hidden in banana and palm trees, safe in the fold of the Mekong that practically surrounds it. Time has stopped in Luang Prabang somewhere in the early 20th century. If anything has been constructed since, you don't notice it. 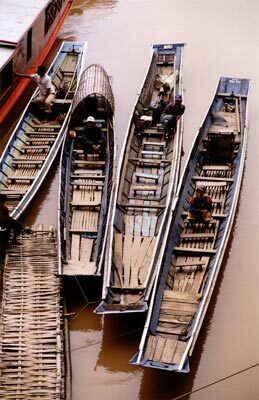 Colonial French architecture mingles with traditional Lao stilt houses and more wats than you can identify. In the centre of all this, the royal palace, now national museum, sits sedately in a well-clipped garden. Built by the French in a Khmer style, there's nothing Lao about it, but I suspect few visitors know or care. 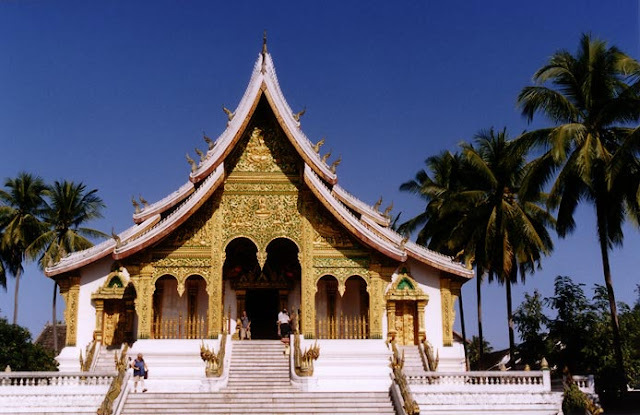 On the palace grounds stands Wat Ho Prabang, which was built to host the Golden Buddha (Pra Bang, that gave the city its name and whose gift to Laos is considered to mark the beginning of Buddhism in the country), but it was never completed. Its façade looks for the world as if it had been dipped in molten gold, and I was seriously unable to look at it under the blazing sun without being blinded. Across the road from the gate to the royal gardens rises the sacred hill of Phou Si, at the foot of which are permanently stationed a handful of makers of a funny little assemblage of banana leaves and flowers, meant to be all at once an offering, a candleholder and an incense burner. 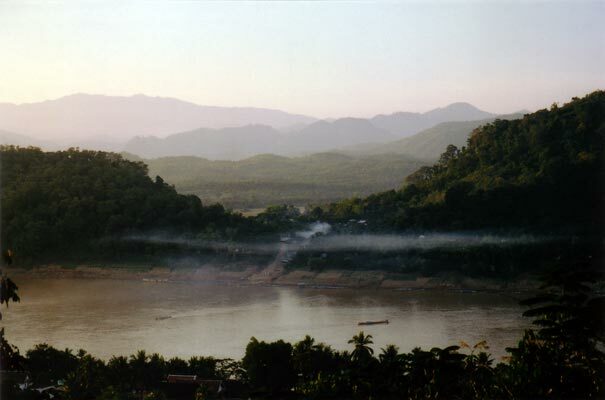 The top of the hill is under assault every day at sunset by a crowd of tourists who want to see the sun set on Luang Prabang. A perfect waste of time because first, the crowd makes it impossible to see and second, there is a pole smack in the middle of the vista, instant annihilation of photographic ambitions. 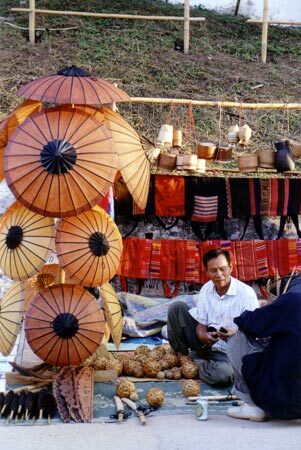 The foot of Phou Si hill is taken over by sellers of those votive banana-leaf candleholders. 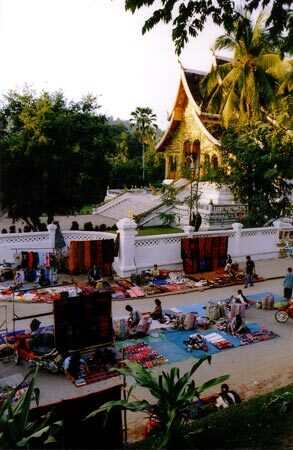 During the day, the town is quiet, shying away from the heat, but in the morning and evening, two markets animate it. 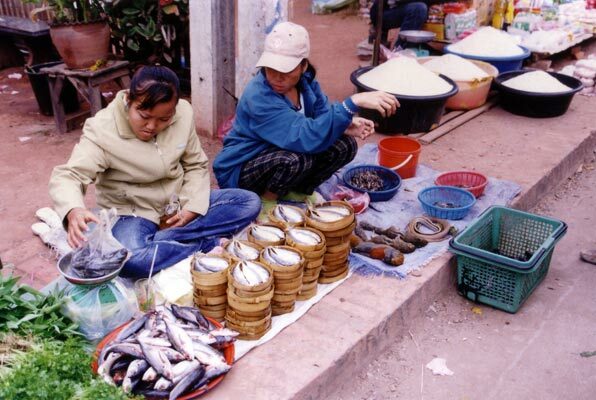 The morning market extends along the Mekong bank and offers a vast assortment of foodstuff – indeed much vaster than I'd have liked. There were things I could have done without seeing on display, such as dried rats, squirrels, snakes, guinea pigs, bats still twitching and other nameless "treats". Abstraction made of these dishes that no kind Lao would offer a foreigner, I found the food much tastier than in Viêt Nam, where I was all but condemned to noodle soup and stir fry that always tasted the same. Laap, a national dish consisting of finely ground meat with finely ground herbs and vegetables, is a vile affair, but I love the sticky rice. The Lao store it in woven boxes they sling over their shoulder, and when it's time for a snack they plunge a hand in and knead out a mouthful-sized ball. The rice is so sticky to itself it leaves the box clean. I also love the way food is wrapped into banana leaves, that can be disposed of anywhere in this jungle-claimed country. Best of all though was a dainty of black rice I bought on the street: it comes stuffed in a bamboo tube that has been stripped of its hard outside. When hungry, you strip the bamboo away from the rice, leaving just one strip for your fingers to hold, and then you can munch on the rice – and drop the bamboo once you're done. On display with the fish: squirrels, guines pigs, snakes, bats... Gah! I also got to try the food of the monks. 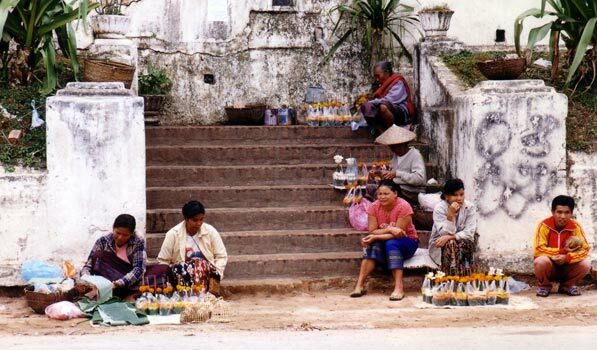 Somehow I always stepped out of the guesthouse as the morning alms started, and there were women on the street waiting with food offerings. One of them would then run to me and try to sell me some for me to give the monks. She seemed to think it would be a tourist's treat; I found the idea horrifying, like feeding peanuts to monkeys (if not done in sincere belief and reverence like the locals, that is). She never understood why I refused and persevered in pestering me, so one morning I bought a bunch from her, thinking it was regular rice and that it would make my breakfast. I was mistaken: what was so carefully wrapped in these banana leaves was a kind of rice-based gelatinous cake, slightly sweet, and coloured green or pink. It's not bad, but I do hope that is not all monks live on! 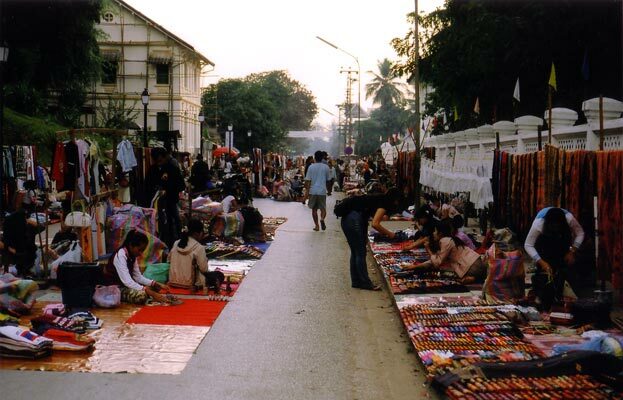 The evening market takes over Sisavangvong at sunset. The second market is the night market. 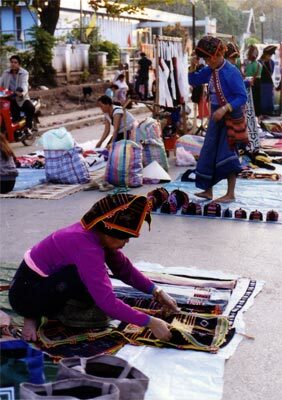 Before sunset sellers, both Lao or from hilltribes, stream into the main street, Sisavangvong, and start setting up their wares, so that by nightfall the street is completely closed over hundreds of meters to all but pedestrian traffic. It is a dazzling sight and a wonderful place to stroll, though it's quite impossible to do so without yielding to temptation. 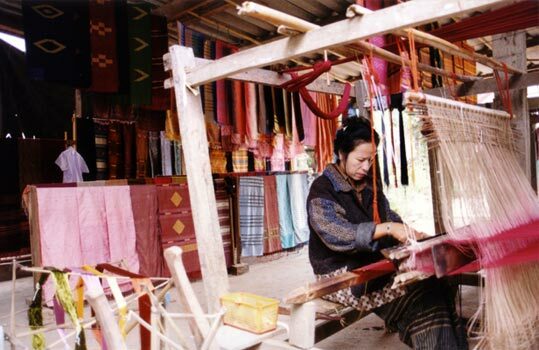 Silk scarves, embroidered blanket, daggers, musical instruments, mulberry-paper books, jewelry, antiques, waterpipes, hilltribes artefacts and dress, more silk – it's a treasure trove and a deadly trap! 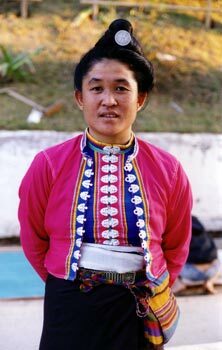 I stalked the White Thai women there at sunset in their colourful attire… Soon I'd be off to meet the hilltribes in their own villages. scarves wear a silver coin in their hair.